Bishop Asser informs us that Alfred had a great love of jewelled ornaments. 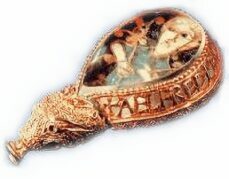 His crown, which unfortunately no longer survives, is listed in an inventory of jewels melted down by Oliver Cromwell at the establishment of the Protectorate, it is described as being studded with emeralds. 1661 – Oliver Cromwell, Lord Protector of the Commonwealth of England is ritually executed after having been dead for two years on the anniversary of the execution of the monarch he himself deposed. #AceHistoryNews says following on from `International Woman’s Day‘ l thought this post about `Women’s Right to Work’ was apt. Firstly this act changed the previous legal situation, in which all property automatically transferred to the control of a husband on marriage. It granted some limited separate protection to a married woman’s property and also permitted women to retain up to £200 of their own wages or earnings. Similar changes did not take effect in Scotland until 1877. Because of high birth rates and improving life expectancy, Victorian families were generally large. The growth of residential domestic service, even low down the social scale, and the prevalence of lodgers, especially in towns, meant that many households were further swollen in size and complex in formation. Although households consisting of more than two generations or containing more than one husband/wife partnership had never been common in Britain, there was a tendency, especially in textile districts, for grandparents to live in households containing young children, particularly where mothers were working outside the home. 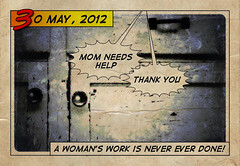 …many households were dependent upon female earnings, especially those households run by widows. Many young people, especially young women, migrated to towns and cities in search of work as the possibilities of agricultural employment declined. Migration was facilitated by family and other connections: communities were recreated in towns and cities through local concentrations of settlement of particular ethnic, religious, regional or familial groups and by the possibility of finding accommodation through lodging or domestic service in the homes of contacts of this kind. Most households necessarily drew income from a number of sources, with many women and juveniles adding to wage earning even if their employment was usually more intermittent and low-paid than that of adult males. Although the male breadwinner wage was increasingly regarded as the ideal and even the norm, in practice many households were dependent upon female earnings, especially those households run by widows. As the mid-Victorian boom got under-way the demand for female and juvenile labour expanded, particularly where new technologies or patterns of work were resented by skilled men. Cheap female and immigrant labour was often used to undercut male workers. Urbanisation created manifold opportunities for female employment despite the regulation of hours and conditions of work for women and juveniles in certain sectors, and the coming of compulsory education after 1871. Thus most women in Victorian society, in the two-thirds of the population below the upper and middle classes, worked for wages. But in what occupations and how much? Workers in a hat factory ©One of the greatest problems facing the historian of women’s work is the absence of reliable information. The census enumerators’ books are the most obvious source, especially for the period after 1841 when occupations were included; but in practice such information is vastly more accurate for men than for women for several reasons. Firstly, contradictory and inconsistent instructions were given about how to classify women’s work, particularly where this involved home-working or consisted of helping in a family run business (such work was sometimes deliberately excluded from the record). Furthermore, women’s work was often part-time, casual, and not regarded as important enough to declare. Women may have also have preferred to keep their income-earning a secret from their husband. Sometimes it was illegal (as with prostitution) or performed in unregulated sweatshops (a further reason for failure to record). Women may have also have preferred to keep their income-earning a secret from their husband. An occupational designation, for whatever reason, meant something very different for men than for women. With the emphasis primarily upon their role as wives and mothers, women workers did not usually see their occupation as a centrally defining characteristic of their lives, and therefore frequently failed to declare it. Business records can be used to supplement the census and to give an indication of the gender-specific nature of employment and wage earning in certain firms and regions. But the survival of wage books is generally poor and biased in favour of larger firms in the regulated sector – for example factory textile employment, where wages and employment levels were generally much higher than the norm. Trade directories are another useful source but suffer from the fact that they were published irregularly, and record not employment but the names of business proprietorships. Household budgets have recently been used for research on women’s work. They have the advantage that they generally record all incomes, including poor relief and self-provisioning, allowing one to assess the contribution of women and juveniles to the family economy. Their disadvantage is that they have patchy survival over time and region, and they have varying levels of detail, accuracy and comparability because they were compiled for differing purposes. Working in the rag trade ©What do we know from the difficult evidence about patterns of women’s work over time and in different regions and sectors of the economy? The most obvious feature of women’s work was its importance to most families, its variability across time and space and its persistent association with certain trades and sectors. Female employment in the 1850s, 60s and 70s appears to have been higher than any recorded again until after World War II. Family budget evidence suggests that around 30-40 per cent of women from working class families contributed significantly to household incomes in the mid-Victorian years. This might have been even higher during the industrial revolution decades, before the rise of State and trade union policies regulating female labour and promoting the male breadwinner ideal. As in earlier centuries, the bulk of waged work for women appears to have been found in trades associated with female skills or proclivities, particularly where these were also casual and low paid. Domestic service of all kinds was the single largest employer of women (40 per cent of female occupations stated in the census of 1851 in provincial cities and 50 per cent in London). The textile and clothing sectors came a close second. Women were also found in large numbers in metal wares and pottery and in a variety of petty trades, especially in towns: confectionery, brewing and other provisioning, seam-stressing, laundry work, cleaning and retailing. Because many sectors which employed large numbers of women were concentrated in certain regions of the country (as with the cotton and woollen industries of south Lancashire and west Yorkshire), the statistics of female labour force participation varied across the country. Outside the working classes the traditional view of Victorian women is that they were little involved in business or enterprise and that their lives were largely devoted to the private sphere of domestic and family life. Certainly the cultural and evangelical ideals of the period placed women on a pedestal of moral probity, motherhood and domestic orderliness. There is some evidence that middle class women in some sectors of the economy did increasingly withdraw from direct involvement in family firms in the mid-Victorian period, whilst the legal status of married women and their limited property rights made it difficult for them to operate in business on their own account at least before the 1880s. …the stereotype of the middle-class woman as the angel in the house can easily be overplayed. However, the stereotype of the middle class woman as the angel in the house can easily be overplayed. Widows and spinsters were rarely in a position to rest on their laurels or be ladies of leisure. 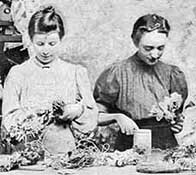 Many of the former carried on family businesses after the death of their husbands, whilst the significant surplus of spinsters in Victorian society found work as governesses or in trades which were regarded as suitable for women such as millinery and inn-keeping, grocery retailing and other victualling. Both widows and spinsters were prominent in property ownership and in financing businesses as sleeping partners. The typical firm in the 19th century was a small family partnership. Because of this many opportunities existed for wives and daughters to be closely involved. There is evidence of their important roles, especially behind the scenes: in retailing, book-keeping, correspondence, dealing with clients, arranging deals. 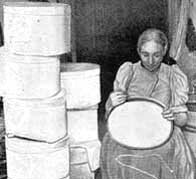 Making hat boxes ©The nature of industrialisation was much influenced by the prevalence of women’s work and by the wider role of women in Victorian society. Women were prominent in many sectors which underwent considerable technological and organisational change partly because employers at first found it easier to recruit women and juveniles to new practices in the face of opposition from established, unionised or skilled adult male workers. Women provided a flexible, cheap and adaptive workforce for factories and sweatshops, and had feminine skills associated with some of the most rapidly expanding consumer goods industries at the forefront of industrialisation such as textiles, pottery, clothing and victualling. Some new technologies were adapted and modified with young female workers in mind, while the cheap labour of women and children could also hold back mechanisation in favour of traditional labour intensive methods. Regional and sectoral variations in the extent to which women were involved in waged work had a major impact upon regional differences in gender relations within families and communities, and upon the complexion of local politics and trade unionism. Women’s wage-earning ability often gave them more influence over wider familial and community decision-making. This included decisions about consumption, and has been held partly responsible for the increasing independence and fashion consciousness of young women, and the rise in mass spending on household goods, clothing, furniture, curtains and foodstuffs. The more women worked for wages the less time they had to produce their own goods for the home. 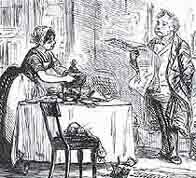 Victorian working women bore the brunt of household duties (Punch cartoon, 1894) ©In areas where many women, including married women, worked full-time for wages (for example in some of the cotton textile towns of the north-west such as Preston) there may have developed greater sharing of housework between men and women, and a more prominent role for women in local politics. However, there are more examples where working women shouldered the double burden of waged work and the bulk of household responsibilities, and where their role in politics remained marginal. As the 19th century progressed, there was a greater prevalence of gender-specific employment which was often used to enhance control and discipline in the workplace. Supervisory roles were almost exclusively taken by men, and men also came to operate the most expensive and sophisticated machinery and to monopolise the high status and higher paid jobs even in textiles. The expansion of heavy industries such as iron, steel, mining, engineering and ship building in the later century also created sectors which employed almost exclusively male labour, which were associated solely with male attributes and which endorsed the male breadwinner ideal. Thus a hardening of gender assumptions in the nineteenth century was closely associated with corresponding changes in the workplace. Women’s History in Britain, 1850-1945 ed. June Purvis (London UCL Press 1995) A collection of essays covering a range of topics from women’s work and the family to education, health, sexuality and politics. Women, Gender and Industrialisation in England, 1700-1870 by Katrina Honeyman (Basingstoke Macmillan, 2000) A concise volume good on gender, class and industrialisation. The First Industrial Woman by Deborah Valenze (Oxford OUP, 1995) Good on the implications of shifting employment patterns, agricultural work and domestic service. A History of European Women’s Work, 1700 to the present by Deborah Simonton, (New York Routledge, 1998) Good for the longer time perspective and for European similarities and contrasts. The Womens’ Library An organisation of historians of women in Britain promoting research and writing on women’s history. This website also contains a number of very useful links to other websites associated with the history of women. Spartacus Schoolnet A website directed at schools containing biographies of key women in the history of the British women’s movement. There a several museums which help to recapture the nature of Victorian society and the place of women within it, most obviously the Victoria and Albert Museum in London which has wonderful collections of art and artefacts reflecting the nature of the middle and upper-class Victorian home. Smaller museums yield information and evidence of women’s work and their patterns of dress and consumption. Most notably Quarry Bank Mill at Style, Cheshire; the textile museum in the Halifax Piece Hall; and Platt Hall Museum, Manchester. The new industrial and commercial middle classes of the Victorian era were great patrons of the arts, and some British provincial art galleries contain major collections of the sorts of works which they commissioned as well as work depicting domestic interiors and women. Amongst the best of these art galleries are the Birmingham City Art Gallery and the Walker Art Gallery, Liverpool. Consult some primary sourcesT detailing the nature of women’s work and household activities such as business records, census enumerator’s books, trade directories, household budgets and private diaries. Details of business records relating to women in the West Yorkshire textile industries can be found in The West Riding Wool Textile Industry: a catalogue of business records by Pat Hudson, (Edington, Pasold, 1976). Other guides to archive holdings can be found on the websites of most major repositories. Many collections of working class autobiographies have been published and include several written by women. For a guide see for example, The Autobiography of the Working Class: an annotated critical bibliography vols 1-3 ed. by J. Burnett, D. Vincent and J. Mayall, (Hassocks Harvester 1984, 1987, 1989). Examining surviving Victorian housing from outside and from within can be very revealing particularly if these can be matched to information from Census returns. It is possible to reconstruct Victorian households at each census point and to imagine where each household member resided within the house. In many major cities there are now organised walks which are helpful in tracing Victorian history and women’s history trails. Details of these can usually be obtained from local history libraries. Pat Hudson is Professor of History in the School of History and Archaeology at Cardiff University. She specialises in the impact of economic and social change within different local and regional, economic, social and cultural settings. Her books include The Industrial Revolution (London, 1992). I LOVE HISTORY …and research!!! 75 years ago today, OUTSTANDING video quality! Jack Gilkenson posted in I LOVE HISTORY …and research!!! 75 years ago today, OUTSTANDING video quality! A RARE sheet of music dating back hundreds of years has been discovered at the county’s records office. The historical document, believed to be from the 14th or 15th century, was discovered as final preparations are made to move thousands of documents to a new archives centre on Hereford’s Rotherwas Industrial Estate. The current office in Harold Street, St James, will close temporarily on January 1 to allow contents to be cleaned and re-packaged ahead of the move. The contents for cleaning include 17,500 boxes and 5,000 maps. Anyone wishing to carry out research at the office can do so from November 4 to 9 and from December 9 to 14. These dates will be the last chance to view records until the new centre opens, unless visitors pay a small fee. Councillor Roger Phillips, Herefordshire Council cabinet member for enterprise and culture, said: “The archives and records staff have a monumental task ahead of them in order to correctly prepare thousands of important historical documents ahead of their move to the new centre. “During the process so far, a number of fascinating documents have been discovered, including a rare sheet of medieval music, and it is imperative that we preserve these documents for future generations. Elizabeth I (7 September 1533 – 24 March 1603) was queen regnant of England and Ireland from 17 November 1558 until her death. Sometimes called “The Virgin Queen“, “Gloriana” or “Good Queen Bess“, Elizabeth was the fifth and last monarch of the Tudor dynasty. The daughter of Henry VIII, she was born into the royal succession, but her mother, Anne Boleyn, was executed two and a half years after her birth, and Elizabeth was declared illegitimate. On his death in 1553, her half-brother, Edward VI, bequeathed the crown to Lady Jane Grey, cutting his two half-sisters, Elizabeth and the Roman Catholic Mary, out of the succession in spite of statute law to the contrary. His will was set aside, Mary became queen, and Lady Jane Grey was executed. In 1558, Elizabeth succeeded her half-sister, during whose reign she had been imprisoned for nearly a year on suspicion of supporting Protestant rebels. Elizabeth set out to rule by good counsel, and she depended heavily on a group of trusted advisers led by William Cecil, Baron Burghley. One of her first moves as queen was the establishment of an English Protestant church, of which she became the Supreme Governor. This Elizabethan Religious Settlement later evolved into today’s Church of England. It was expected that Elizabeth would marry and produce an heir to continue the Tudor line. She never did, however, despite numerous courtship’s. As she grew older, Elizabeth became famous for her virginity, and a cult grew up around her which was celebrated in the portraits, pageants, and literature of the day. In government, Elizabeth was more moderate than her father and half-siblings had been. One of her mottoes was “video et taceo” (“I see, and say nothing”). In religion she was relatively tolerant, avoiding systematic persecution. After 1570, when the pope declared her illegitimate and released her subjects from obedience to her, several conspiracies threatened her life. All plots were defeated, however, with the help of her ministers’ secret service. Elizabeth was cautious in foreign affairs, moving between the major powers of France and Spain. She only half-heartedly supported a number of ineffective, poorly resourced military campaigns in the Netherlands, France, and Ireland. In the mid-1580s, war with Spain could no longer be avoided, and when Spain finally decided to attempt to conquer England in 1588, the failure of the Spanish Armada associated her with one of the greatest military victories in English history. Elizabeth’s reign is known as the Elizabethan era, famous above all for the flourishing of English drama, led by playwrights such as William Shakespeare and Christopher Marlowe, and for the seafaring prowess of English adventurers such as Sir Francis Drake. Some historians are more reserved in their assessment. 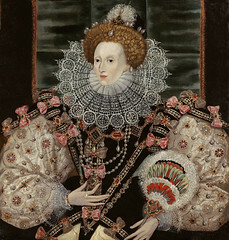 They depict Elizabeth as a short-tempered, sometimes indecisive ruler, who enjoyed more than her share of luck. Towards the end of her reign, a series of economic and military problems weakened her popularity. Elizabeth is acknowledged as a charismatic performer and a dogged survivor, in an age when government was ramshackle and limited and when monarchs in neighbouring countries faced internal problems that jeopardised their thrones. Such was the case with Elizabeth’s rival, Mary, Queen of Scots, whom she imprisoned in 1568 and eventually had executed in 1587. After the short reigns of Elizabeth’s half-siblings, her 44 years on the throne provided welcome stability for the kingdom and helped forge a sense of national identity. The last speech delivered by Queen Elizabeth I of England. Given to 141 members of the House of Commons on 30 November 1601. We have heard your declaration and perceive your care of our estate. I do assure you there is no prince that loves his subjects better, or whose love can countervail our love. There is no jewel, be it of never so rich a price, which I set before this jewel: I mean your love. For I do esteem it more than any treasure or riches; for that we know how to prize, but love and thanks I count invaluable. And, though God hath raised me high, yet this I count the glory of my Crown, that I have reigned with your loves. This makes me that I do not so much rejoice that God hath made me to be a Queen, as to be a Queen over so thankful a people. Therefore I have cause to wish nothing more than to content the subject and that is a duty which I owe. Neither do I desire to live longer days than I may see your prosperity and that is my only desire. And as I am that person still yet, under God, hath delivered you and so I trust by the almighty power of God that I shall be his instrument to preserve you from every peril, dishonour, shame, tyranny and oppression, partly by means of your intended helps which we take very acceptably because it manifesteth the largeness of your good loves and loyalties unto your sovereign. Of myself I must say this: I never was any greedy, scraping grasper, nor a strait fast-holding Prince, nor yet a waster. My heart was never set on any worldly goods. What you bestow on me, I will not hoard it up, but receive it to bestow on you again. Therefore render unto them I beseech you Mr Speaker, such thanks as you imagine my heart yieldeth, but my tongue cannot express. Mr Speaker, I would wish you and the rest to stand up for I shall yet trouble you with longer speech. Mr Speaker, you give me thanks but I doubt me I have greater cause to give you thanks, than you me, and I charge you to thank them of the Lower House from me. For had I not received knowledge from you, I might have fallen into the lapse of an error, only for lack of true information. Since I was Queen, yet did I never put my pen to any grant, but that upon pretext and semblance made unto me, it was both good and beneficial to the subject in general though a private profit to some of my ancient servants, who had deserved well at my hands. But the contrary being found by experience, I am exceedingly beholden to such subjects as would move the same at first. And I am not so simple to suppose but that there be some of the Lower House whom these grievances never touched. I think they spake out of zeal to their countries and not out of spleen or malevolent affection as being parties grieved. That my grants should be grievous to my people and oppressions to be privileged under colour of our patents, our kingly dignity shall not suffer it. Yea, when I heard it, I could give no rest unto my thoughts until I had reformed it. Shall they, think you, escape unpunished that have oppressed you, and have been respect less of their duty and regardless our honour? No, I assure you, Mr Speaker, were it not more for conscience’ sake than for any glory or increase of love that I desire, these errors, troubles, vexations and oppressions done by these varlets and lewd persons not worthy of the name of subjects should not escape without condign punishment. But I perceive they dealt with me like physicians who, ministering a drug, make it more acceptable by giving it a good aromatical savour, or when they give pills do gild them all over. I have ever used to set the Last Judgement Day before mine eyes and so to rule as I shall be judged to answer before a higher judge, and now if my kingly bounties have been abused and my grants turned to the hurt of my people contrary to my will and meaning, and if any in authority under me have neglected or perverted what I have committed to them, I hope God will not lay their culps and offenses in my charge. I know the title of a King is a glorious title, but assure yourself that the shining glory of princely authority hath not so dazzled the eyes of our understanding, but that we well know and remember that we also are to yield an account of our actions before the great judge. To be a king and wear a crown is a thing more glorious to them that see it than it is pleasant to them that bear it. For myself I was never so much enticed with the glorious name of a King or royal authority of a Queen as delighted that God hath made me his instrument to maintain his truth and glory and to defend his kingdom as I said from peril, dishonour, tyranny and oppression. There will never Queen sit in my seat with more zeal to my country, care to my subjects and that will sooner with willingness venture her life for your good and safety than myself. For it is my desire to live nor reign no longer than my life and reign shall be for your good. And though you have had, and may have, many princes more mighty and wise sitting in this seat, yet you never had nor shall have, any that will be more careful and loving. For I, oh Lord, what am I, whom practices and perils past should not fear? Or what can I do? That I should speak for any glory, God forbid. And I pray to you Mr Comptroller, Mr Secretary and you of my Council, that before these gentlemen go into their countries, you bring them all to kiss my hand.